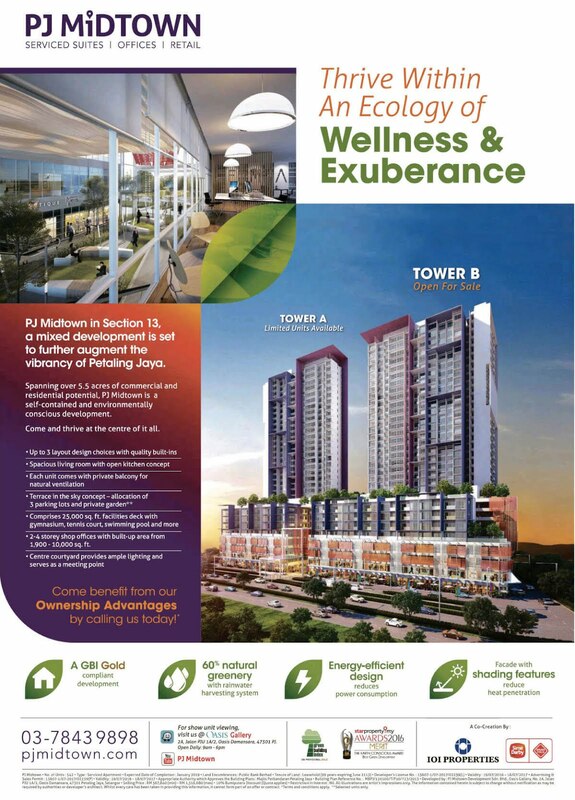 PJ Midtown in Section 13, Petaling Jaya, Selangor is a mixed development is set to further augment the vibrancy of Petaling Jaya. Spanning over 5.5 acres of commercial and residential potential, P] Midtown is a self-contained and environmentally conscious development. Developed by : PJ Midtown Development Sdn. Bhd. Selling Price : RM 567,840 (min) - RM 1.516.680 (max). 10% Bumiputera Discount (Quota applies). * Up to 3 layout design choices with quality built-ins. * Spacious living room with open kitchen concept. * Each unit comes with private balcony for natural ventilation. * Comprises 25,000 sq.ft. facilities deck with gymnasium, tennis court, swimming pool, and more. * 2-4 storey shop offices with built-up area from 1,900 - 10,000 sq. ft.
* Centre courtyard provides ample lighting and serves as a meeting point. * GBI Gold compliant development. * 60% natural greenery with rainwater harvesting system. * Energy-efficient design, reduced power consumption. * Facade with shading features to reduce heat penetration. The information contained herein is subject to change without notification as may be required by authorities or developer’s architect. Whilst every care has been taken in providing this information, it cannot form part of an offer or contract.